Original artwork for Captain America Vol. 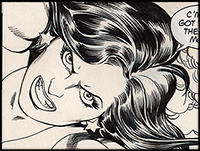 3 #1 (Marvel Comics, 1998), by Ron Garney (pencils) and Bob Wiacek (inks). 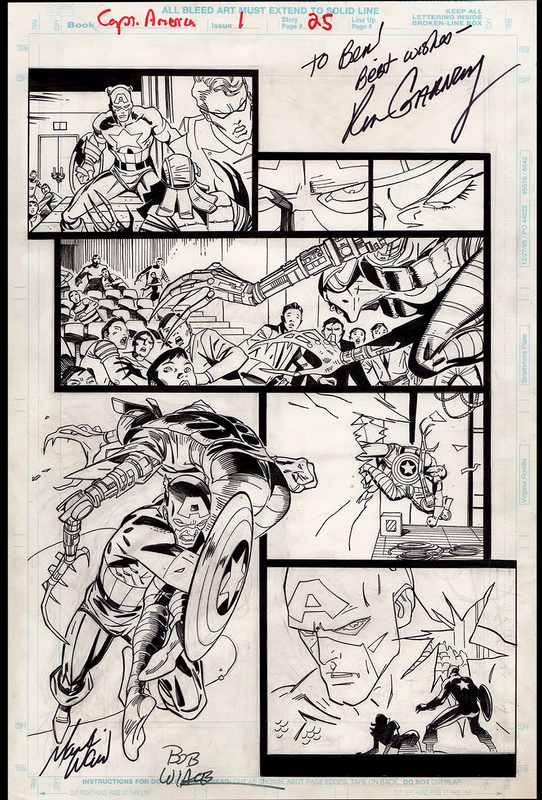 This is page 25 from the very first debut issue of the third volume for the story entitled, "The Return of Steve Rogers, Captain America," written by seasoned scribe Mark Waid. This exciting scene depicts the climatic action sequence as the Sentinel of Liberty goes toe-to-toe with the deadly Lady Deathstrike (Yuriko Oyama) in a movie theatre that is showing a film about Captain America's historical exploits. Absolutely classic large fifth panel as Captain America plows into Lady Deathstrike to win the day for Life, Liberty and the American Way. Signed by all three creative artists: writer Mark Waid, penciler Ron Garney and finisher Bob Wiacek.